The following table illustrates and explains how to install the print cartridge. Remove the print cartridge from its packaging. Bend and then pull the sealing tab from the end of the print cartridge to remove the entire length of the tape. CAUTION: Avoid touching any black toner on the tape. If the toner gets on clothing, wipe it off with a dry cloth and wash the clothing in cold water. Hot water sets the toner into the fabric. 3.Lift the printer top cover. 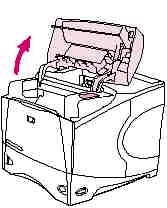 4.Slide the print cartridge into the printer as far as it can go. NOTE: If the top cover does not close, make sure that the print cartridge is correctly installed. Send a print job to your printer. If the job does not print, walk over to the printer and press the "Power" button until a test page starts to print. This verifies that the printer itself is working, and that the problem lies in the communication between the printer and the PC. Click on the "Start" button on your computer and choose "Control Panel." Double-click on "Administrative Tools" and then "Services." Scroll down to Print Services, right-click it and choose "Start." Try your print job again. 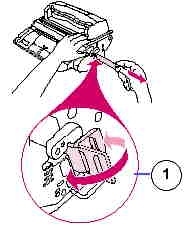 Remove and reseat the printer cable if the printer still does not respond. Make sure the cable is firmly connected on both ends. If the print job still fails to print, try replacing the cable. Examine the quality of the printouts from the printer. If the printouts are light or appear faded, the toner or ink cartridge needs to be replaced. Install a new print cartridge and try your print job again. Clean the interior of the printer if the printouts appear smeared, or if there are spots on the pages. Spots and smudges are typically caused by loose toner powder or ink residue inside the printer. The best way to clean the printer is with a small vacuum cleaner like the kind used to clean computer components.